Arkansas: Bad For Tenants…But Is It Good For Landlords? The U.S. state of Arkansas was recently featured in an excellent Vice News piece on what tenants in Bill Clinton’s home pasture deal with when they rent. 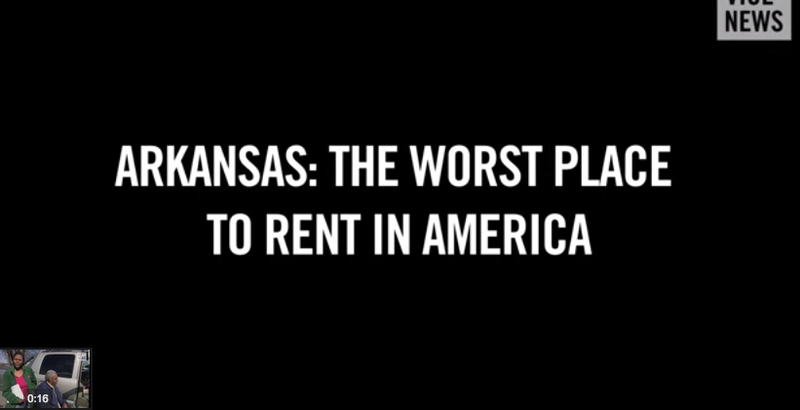 The piece – entitled “Arkansas” The Worst Place To Rent In America” – was a fascinating look into a place where the lack of laws regulating the rental market work backwards. As founders of a software that serves landlords – not really tenants – and as landlords ourselves, we’d be lying if we said we didn’t sympathize more with the plight of property owners renting out to tenants. As we’ve said before, it’s a thankless job most of the time. With that said, we’re also advocates of healthy and productive relationships between landlords and tenants. Relationships that are fair, follow the law in whatever province, state, or district you happen to be in, and that include methods and approaches that are reasonable and equitable. Here’s a few key things in Arkansas. It’s the only state in the entire country that has no “implied warranty of habitability”. In english, that means landlords have no legal obligation to repair or maintain their properties – unless there was a written or oral agreement to fix something. It’s also the only state where you can be fined and jailed if you don’t pay your rent on time. Seriously. Here it is. To real estate investors – this could be perceived as an ideal place to invest your money. The existing law favours landlords heavily, and repossessing property there is fairly easy to do when tenants don’t pay rent. On the other side of the debate, a 3rd of Arkansas’ almost 3 million residents are renters, and a high percentage of those renters have serious concerns and issues with the properties they rent. Most renters are agreeing to take their units “as is”. By law – tenants are required to pay their rent no matter what – even if landlords don’t repair or maintain their buildings and units. Taking into account that Arkansas is the second poorest state in the U.S., and that 18% of the population live below the poverty line, this creates a situation where in arrears renters get swept up into the criminal justice system. As a tenant, if you don’t pay your rent – even if your roof has holes in it and your windows are broken, not paying gives you 10 days to vacate. If you don’t – you could go to jail. Don’t bother contesting the order to vacate, because in the vast majority of cases, tenants don’t get the opportunity. The legal process for getting in front of a judge is convoluted by the black and white insistence of whether the money is owed, and if it is, for whatever reason that might be, you’re more likely to see the inside of a jail cell than a judge. The state’s unique “failure to vacate” law sees tenants charged as criminals purely on their landlords’ say-so, without any independent investigation by prosecutors. That’s why 90% of tenants who receive an order to vacate decide to just leave. It’s simply a criminal issue immediately. To boot – Arkansas is one of only 10 states that don’t prohibit retaliatory eviction. For the uninitiated – retaliatory eviction is when the landlord doesn’t like something you’ve done..like the reporting of a health or building code violation…and wants you out of the unit. So, in short – if you’re landlord doesn’t like your face, you can be evicted. If you make a complaint, you can be evicted. If your landlord simply wants you out of the unit, and you’ve been paying on time – they can rip up a good check or make themselves conveniently unavailable to accept cash from you on whatever agreed upon date, and you’d technically be evictable. This is all a far cry from some of the provinces and states that have laws that in some cases favour tenants. Good laws achieve as much of a possible balance possible between the obligations of providing habitable and functional dwelling to people paying for them while also protecting the landlord’s rights and property. The lack of this in Arkansas has police being involved with evicting people for not paying their rent – an almost ridiculous waste of that resource – and people who don’t pay their rent for whatever reason in many cases entering the criminal justice system. What do you think? Are you an Arkansas landlord? Are you an Arkansas tenant? Share your thoughts with us.